Sitting at a restaurant table in Munich in the summer of 1932, Hitler designed the prototype for what would become the immensely successful Beetle design for Volkswagen (literally, the "car of the people"). In an era where only the most economic elite possessed cars, Hitler believed that all people should be able to own a car and additionally thought that a smart design could allow for reliability, enjoyment, and vacation travel. 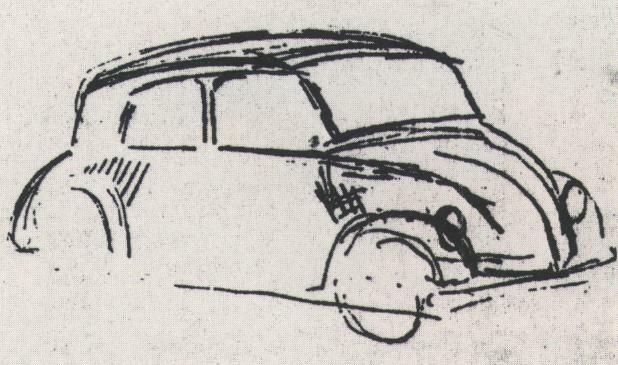 The name given to the car in 1938 was Kraft durch Freude (KdF-Wagen, literally "strength through joy car"). Hitler gave his design to the head of Daimler-Benz, Jakob Werlin, and stressed its importance. "Take it with you and speak with people who understand more about it than I do. But don't forget it. I want to hear from you soon, about the technical details."